Our Miami car accident law firm knows that accidents can unfortunately happen at any time and any location. Most car accidents are nothing more than a routine nuisance which lead to weeks in a rental, and possibly a quick doctor’s visit. However, there is nothing routine about a rollover accident. Rollover accidents are among the most catastrophic car accidents and often result in severe injuries and damage to the vehicles. If you or a loved one have been involved in a rollover accident, you may be entitled to receive compensation for your injuries. In 2014, 109 accidents were reported as rollovers, representing nearly 3 percent of the total accidents. This proves how rare rollover accidents truly are – in both Florida and throughout the country. More than 10,000 people are killed each year throughout the country in rollover accidents. This number accounts for approximately 30 percent of the total motor vehicle accidents throughout the country. While some rollover accidents are caused by the impact of another vehicle, the majority of rollover accidents occur when drivers attempt to overcorrect themselves, either from veering too far to one direction, or to avoid hitting another vehicle or object. Rollover accidents are more prevalent among “top heavy” vehicles, such as sport utility vehicles and trucks. However, rollover accidents can occur to any vehicle which may take a curve at a high rate of speed, or a vehicle which collides into another vehicle. Rollover accidents are incredibly traumatic accidents, and the memory of the accident often haunts victims for years to come. The primary victims of rollover accidents are often the passengers in the vehicle which has flipped over. However, rollover accident victims can also occur after one vehicle crashes into another, forcing a rollover. An experienced accident attorney can assist you in determining the appropriate amount of damages you are entitled to receive after a rollover accident. The lasting impact of a rollover accident may follow the victim for years to come, although a claim for damage will make the financial impact of a rollover accident a little easier to live with. 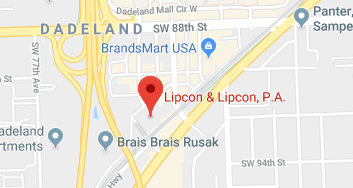 If you or a loved one were injured during a rollover accident, do not hesitate to contact the attorneys of Lipcon & Lipcon. Our attorneys have a combined 60 years of experience in assisting our clients with their injury claims after devastating accidents. A rollover accident is not the type of car accident most people are able to walk away from, and you should be entitled to receive a set amount of damages after the accident. Contact our Miami office today for your initial free consultation.